It’s minus nine degrees today; it feels like minus seventeen with the wind chill. It’s bitter cold, and everywhere you look, people are bundled up in layers, faces shielded against the chill, warm breath visible in little white clouds against the frigid January air. The city streets seem empty this time of year, even at rush hour. The waterfront especially, so often choked with crowds in the languid summer heat, is a veritable ghost town. Winter in Toronto is all about taking shelter – in the Subway, in the Path, in coffee shops and cozy pubs and movie theatres. We rush through our sunless morning commutes, then rush home again in the twilight of late afternoon. But while the rest of the city shuns the icy outdoors in patient anticipation of spring, there remain a mad few who can be seen braving the bitter chill day-in and day-out. I’m talking, of course, about the winter runner. There’s a certain pride that runners seem to take in being called crazy. As in, “You ran twenty-three kilometers? For fun?! You’re crazy!” The incredulity of non-runners is, it seems, the sincerest form of flattery. And when it comes to crazy, there’s none crazier than the die-hard winter runner. It’s not hard to understand why so many people view winter running as a chore, as something to be endured rather than enjoyed. When I get home at the end of the day, the five-minute walk from the Subway to my apartment is more than enough to convince me that fleece pyjama pants and Netflix, not mileage, should be the order of the evening. But the truth is, I love winter running. If you’re staring skeptically at that last statement, I should tell you that I’m not what you might call an “outdoorsy” person. I’m not some prim, nature-fearing city girl, but I’m definitely emotionally dependent on access to a shower and a decent mattress. Camping is my idea of hell. And winter running? It’s heaven. At face value, running in the summer seems like the better choice. But in the city, that’s not always (or even often) the case. Summer in the city means throngs of people, sidewalk congestion, crowds to dodge. It means breathing unpleasant gulps of smog, cigarette smoke, and exhaust fumes from passing busses. It means running in oppressively high temperatures, when even after sunset, the concrete below seems to hold in the heat like a thermos. And yes, there are bad days in the winter, too. There are blizzards and ice storms and polar vortexes that tempt me to stay indoors and hibernate until April. But on balance, I have far more good days in the winter than I do in summer. In winter, the city belongs to me. The deserted streets and empty trails lend themselves easily to the quiet solace of a long run. I have my favourite routes all to myself. Under a blanket of fresh snow, the constant din of Toronto traffic is muffled, calmed even. In a city of two-and-a-half million people, it’s the closest thing you can get to time on your own. I love winter running in the city. But I still struggle to get out the door most days. On an especially cold day, the first five minutes of any run can be awful. The best trick I’ve found for getting out the door is to give myself permission to run less than I need to. If my planned route should be fifteen kilometres, I tell myself I’ll only run five. It’s a lot easier to get out there knowing it might only be for twenty minutes. Invariably, after the first few kilometers, I’m warmed up and comfortable enough to go the actual distance. On stormy winter evenings, I strongly recommend running with music. Listening to a Justin Bieber album in its entirety might make you feel a bit weird about yourself as an adult human being, but it beats the hell out of listening to the wind howl. Dress for the weather. By which I mean, dress one layer warmer than what you think you need. Remember, you can always shed your layers en route, but there’s nothing quite like the unpleasantness of an otherwise great run spoiled by the sensation that your legs are slowly succumbing to frostbite. One of the most underrated perks of the deserted streets of winter is that you can stash a headband, jacket, or pair of gloves somewhere along your route and be reasonably confident that it will still be there for you to pick up on the way back. 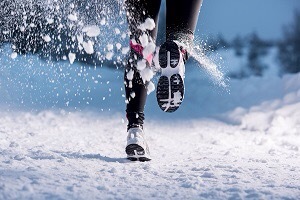 On the best days, a winter run can make you feel invincible. There you are, all alone, out in the dark, impervious to the bitter cold and icy roads, doing something other people simply will not or cannot do. It goes right to the core of our sport, to the essential spirit of distance running – that desire to conquer a seemingly impossible task for no other reason than to prove that we can. On a bad day, the sub-zero temperatures can be an unexpected motivator. In summer, the temptation to cut a bad run short and walk the last few kilometers home can be strong, especially when your route traces some of the city’s more picturesque parks and trails. In winter, there’s no such option. Once you’re out there, miles from home in the freezing cold, the only way back is to do what you set out to do, and run. If you want to forge that special brand of mental toughness needed to do something crazy, like run a marathon, you need to get comfortable doing something equally crazy, like running twenty kilometers in sub-twenty-degree temperatures. I’ve thrown this adage around before, but in a discussion of winter running, it bears repeating; if you’re going through hell, keep going.